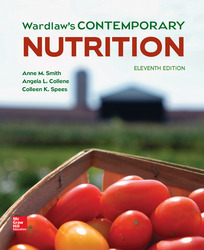 • What's Covered: Wardlaw's Contemporary Nutrition is a complete and balanced resource. Current research is at its core with evidence-based science and new "Farm-to-Fork" and "Ask the RDN" features. • Teaching Approach: The text conveys nutritional concepts and science to all kinds of students, many of whom have limited backgrounds in biology or chemistry, at a level they can easily grasp.